History: The male version of this plant is commonly used in aquariums because it is a good oxygenator and is appealing to the eye. Egeria densa was introduced to North America in the late 1800s and has since found its way to many water systems. Roots: Roots tend to grow in intervals along the stem. Stems/Leaves: The stems can be up to 4m long, and the leaves grow in whorls of 4-8, ranging in size from 1-4cm long and 2-5mm wide. Flowers: Seeds/Fruit: The flowers are white with 3 petals. However, these plants are duioecious, having male and female forms on separate individuals. The female plants are not found outside of its native habitat. Methods of Reproduction/Spread: Egeria densa can reproduce more than one way, giving it the potential to be prolific. It can reproduce by fragmentation and by seed (in its native habitat). Life Style/Habits/Life Duration: Growing in moving or still water, Egeria densa can inhabit many areas. It can form dense matts as it grows and can root at the bottom or exist as a free floating body. This plant goes through two growth spurts, one in the spring, and one at the end of the growing season at which point the female plants flower. Following this, the plant overwinters on the bottom and the foliage dies and decays. Montana infestation/history: none known, for now--let's keep it that way! Environments favorable to infestation: Slow-moving or still water, shallow depths. It tends to favor acidic or nutrient rich waters. 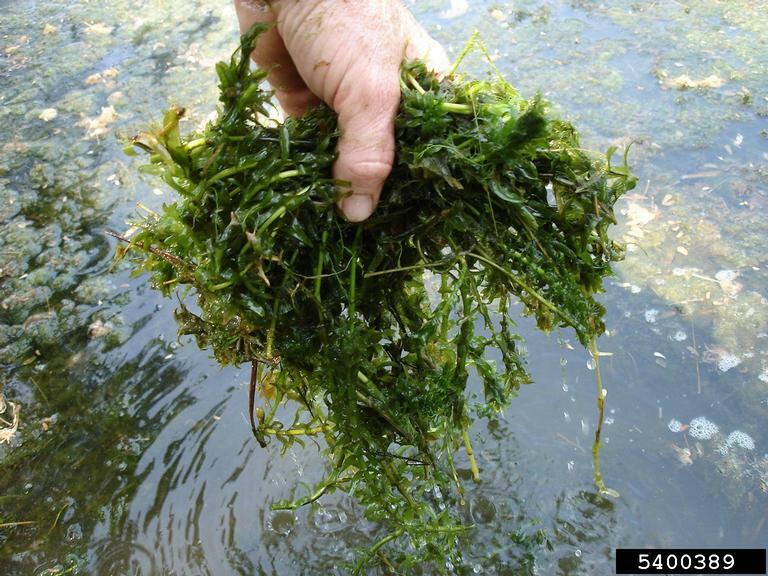 Impacts: Egeria densa grows faster than native plants, and thus can impede upon their natural habitat. It also produces unfavorable conditions for boating, fishing, swimming, as well as creating poor habitat for fish and other aquatic animals. Native Range/Probable Entry Into N. America: This plant is native to Brazil and Argentina. It was likely introduced accidentally in the late 1800s because of its use in aquariums. Chemical: There are many chemicals that can be used to mitigate this weed, but must be used with caution--a specialist should be consulted. Products include acrolein, diquat, floridone, and copper-containing chemicals. Biological: There are some fish that feed on this plant such as the White Amur and the Congo Tilapia. Mechanical: Pulling, harvesting, or digging will temporarily remove the plants but will also encourage spread by fragmenting the plants. Do not release into the environment. Freeze, dry, or wrap and seal aquarium plants before disposal. Wash boats with warm, soapy water or mild bleach before entering new waterways. Make sure that plants from your water garden do not wash into waterways in the proximity in the event of a flood. "Egeria Densa." Bugwoodwiki, n.d. Web. 15 June 2016. <https://wiki.bugwood.org/Egeria_densa>. "Egeria Densa." Plants Rescue. N.p., n.d. Web. 15 June 2016. <http://www.cal-ipc.org/ip/management/ipcw/pages/detailreport.cfm@usernumber=43&surveynumber=182.php>. "Invasive Plants of California's Wildland." Cal-IPC:. N.p., n.d. Web. 15 June 2016. <http://www.cal-ipc.org/ip/management/ipcw/pages/detailreport.cfm@usernumber=43&surveynumber=182.php>. Patterson, Kathleen Mosher, Alan Power, Sloan Sloan, Steve Olson, Sam Chan, and Robin Goettel. "Aquatic Invaders: Sea Grant/AZA Project Explains Pathways to Zoo and Aquarium Audiences." Aquatic Invasions AI 5.1 (2010): 115-17. Web. 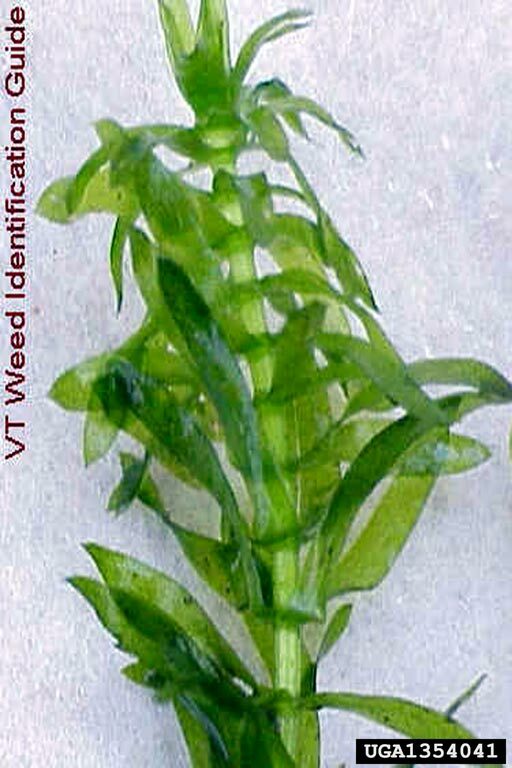 <http://www.iiseagrant.org/NabInvader/AItoolkit/AI_Brazilian_Elodea.pdf>.